A view of Howland Island from the 'crow's nest' of the Odyssey. We have arrived at Howland Island. It would be hard to imagine a smaller, flatter, more featureless place. It's kidney shaped, with its longest axis only 1½ miles, and an average height above sea level under 25 feet. To expose those 25 feet, however, the base rises through more than three miles of water, so that the island is just the very top of a 16,000 foot, underwater mountain. It looks as though any serious storm surge accompanying a typhoon would sweep unobstructed across it. (Typhoons are what people out here in the western Pacific call hurricanes) but equatorial latitudes don't experience typhoons or hurricanes, so perhaps that never happens. At our anchorage and from the deck of the Odyssey there is no visible sign of human occupation save a short, low stone wall. From the mast, however, we can see that it's a flat bulldozed plain of coral sand, without a single tree and with what appear to be bits of ruins scattered over it. Howland does have one notable feature, however, and it's visible several miles away: a solitary, painted tower reminiscent at a distance of a tombstone. It's called the Amelia Earhart beacon. Its complete isolation and loneliness underlines, poignantly, the loneliness of her ocean perishing. The National Parks service is making strong efforts to prevent the importation of foreign species to Howland Island, and they take elaborate precautions to make sure that no one brings in insect eggs, or plant seeds on their clothing. So after years of exploitation and neglect, Howland has a new policy: in Amelia Earhart's day everything that could be done to facilitate her arrival from foreign parts was done. Now everything that can be done to prevent arrivals from foreign parts is done. But I support that policy: it makes excellent biological sense. Howland Island has become a particularly clear example of how humanity sometimes changes its priorities for the better in but a single human lifetime. 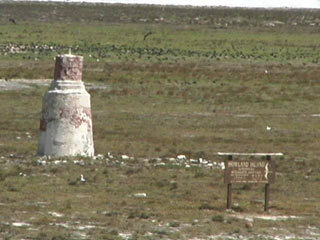 A close-up of the crumbling stone tower which is the Amerlia Earhart Beacon. 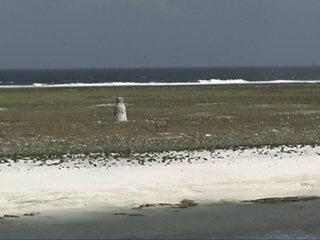 And what is there to protect on such an isolated bit of coral sand? The answer is Seabirds: Howland Island is a major rookery, with thousands of boobies and features the most extraordinary battle line of frigate birds I've ever seen deployed aloft-anywhere in the world. It stretches along the entire coast, hanging up there, waiting, I suppose, for boobies to return with their catch. (Frigate birds as you'll recall from our earlier logs, though larger than boobies are incredibly agile fliers. They seldom catch fish themselves relying instead on robbing the catches of other birds (boobies being a prime target). I tried to count the number of frigate birds in that gauntlet, but gave up when I realized I was seeing well over 400 at one time without crossing to the other side of Odyssey's deck. I see no way that any booby carrying its catch could ever make it past that many frigate birds. I suppose that when it is feeding its chicks the only way a booby can get a fish to them is to return as one of a large flock of boobies, each of which is carrying fish, so that at least some will get past the frigate birds while they're busy attacking their companions. But maybe boobies can only make it to their nests once most of the frigate birds have gotten enough to eat. I wish I had more time and could wait until evening to see whether, when the boobies return, they come back in large flocks, and whether that vast armada of frigate birds then starts launching all-out assaults on them. However, it's time to leave this barren yet productive landscape and make our way back into the open sea in order to head towards our next landfall, 600 miles away in the Gilbert islands. This is Roger Payne talking to you from just off Howland Island-that place Amelia Earhart never reached.